Day one of the 2018 Speedo Sectionals at Iowa City is shaping up to be a collegiate showdown in the team race, with many swimmers from major Division I programs populating the A-Finals of every event. Despite the representation of many elite schools, the University of Kentucky men and the University of Minnesota women established themselves as the most dominant teams on day one. After coming out of this morning’s prelims seeded first, rising sophomore at the University of Iowa Sarah Schemmel led the race from start to finish in a final time of 57.04. Schemmel was followed closely by Malorie Han of Northwestern University, who took second with a 57.39. 15-year old Mckenna Stone from Fox Valley Swim Club posted a 57.43 for third, making her the only non-collegiate swimmer to crack 58 in the finals. University of Kentucky’s Riley Gaines (57.51), Ames Cyclone’s Sophia Sorenson (58.17), Elmbrook’s Kaylyn Schoof (58.19), and Delta Aquatics’s Jessica Davis make up tonight’s A-Final. 14 year old Reilly Tiltmann of Elmbrook Swim Club, who finished third in this morning’s prelims, was disqualified. University of Kentucky junior Jason Head dominated the men’s 100 free, netting the win with a 50.46, the only swimmer in the field under 51. The Wildcats punched in a 1-2 finish with Kentucky teammate John Mitchell out-touching Wisconsin junior Cameron Tysoe, 51.02 to 51.16. University of Kentucky’s Shane Anderson (51.50), University of Iowa’s Joseph Myhre (51.60), Kentucky’s Peter Wetzlar (51.66), Elmbrook’s Michael Linnihan (51.79) and Iowa’s William Scott (52.06) complete tonight’s A-Final. The Minnesota women go 1-2 in the Women’s 200m Breaststroke, with fellow seniors Kaela Marcus and Nicky Ciavarella finishing virtually together in 2:36.57 and 2:36.86 respectively. The two Golden Gophers had almost identical splits. Denying the Gophers a 1-2-3 finish was WEST Swim Club’s Sylvia Kobylak. The 16 year old touched for 3rd in 2:37.74, nearly a second ahead of Minnesota’s Olivia Johnston (2:38.68). University of Kentucky’s Elizabeth Merriman (2:39.23), Badger Aquatic Club’s Alexandra Anagnostopoulos (2:39.41) and Minnesota’s Alexandra Preiss (2:41.54) round off the top eight. Northwestern’s Emma Hruby, who was seeded first heading into tonight’s finals, was disqualified. University of Iowa’s Tanner Nelson won the Men’s 200m Breaststroke all the way from lane 7 with a swift 2:17.70, dropping almost four seconds off of his seed time. The outside smoke pushed his way ahead of the field on the second 50 – where he was the only member of the field to split under a 35 – and never looked back. University of Kentucky’s Kyle Barker had the fastest second 100 of the field, which allowed him to claw back into second with a 2:18.33. Following Barker was Minnesota’s Brenner Hohenstein in 2:18.66, the only other swimmer in the final to break 2:20. Also in tonight’s A-Final was Wisconsin’s Chris Willis (2:20.04) and Benjamin Attenberger (2:21.16), Hickory Willow’s Lucas Smiarowski (2:22.89), Unattached-Iowa’s Caleb Babb (2:23.47) and Minnesota’s Evan Yoder (2:23.75). Rising Kentucky Sophomore Riley Gaines took it out fast and held on all the way to the wall, touching first in 2:16.55, good for a two second drop off of her seed time. Coming in second was Green Bay Swim Club’s Emma Lasecki with a 2:17.62. Iowa’s Kelsey Drake, who had the fastest time coming into the meet, came in third with a 2:18.06. Fox Valley’s Kayleigh Cannon, who finished prelims in 6th place, was disqualified. The Kentucky Wildcats are on a roll tonight, and Daniel Orcutt‘s 200 fly victory was the perfect way to cap off their night. The Kentucky Sophomore was absolutely dominant, winning by over three seconds in 2:01.42. Coming in second was Elmbrook’s Michael Linnihan, sporting almost a nine second drop from his entry time after swimming the 100 free earlier in this session. WEST Swim Club’s Jeffrey Vitek almost kept it close with Orcutt through the first 100, but eventually faded to third, posting a 2:05.63. Fox Valley’s Aayush Deshpande (2:05.79), Saint Charles’s Frank Niziolek (2:06.26), Aligator Aquatics’s Michael Balcerak (2:07.00), Wildkit’s Mark Auger (2:07.00) and Fox Valley’s Michael Schwers (2:08.27) also were represented in the A-Final. Consistency was the name of the game in the Women’s 800m free, as Abbey Erwin cranked out 1:07s after 1:07s to dominate the event in 8:52.69. University of Kentucky’s Payton Neff was Erwin’s closest competitor, as she finished second with a 8:58.84. Rounding out the podium was Lakeside Aquatic Club’s Bryn Handley, who touched for third in 8:58.84. The Barrington Swim Club distance troupe had a great showing in the women’s 800 free, boasting three top eight finishes with Maggie Graves in fourth (9:00.59), Jane Smith in fifth (9:03.63), and Jennifer Tokarz in seventh (9:08.22). Another Barrington swimmer, Bridget O’Leary, narrowly missed the top eight, swimming a 9:11.48 to take ninth. The rest of the top eight includes Riptide Swim Team’s Katia Soudakova (9:04.70) who came in sixth, and University of Minnesota’s Olivia Johnston (9:10.69) who came in eighth. It seemed that outside smoke Nicholas Smith of the Kentucky Wildcats was going to run away with the win at the halfway mark, flipping nearly six seconds ahead of his nearest competition. Two Minnesota Gophers, however, ended up running Smith down in the back-half, setting up a photo finish on the last 50. The Gophers ended up narrowly clinching the 1-2 finish, with Michael Messner taking first in 8:19.69 followed by teammate Nicholas Pachinski in 8:19.72. Smith ended up barely settling for third with a 8:19.90. 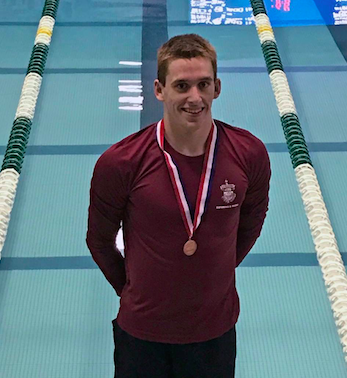 The other swimmers in the top eight were Unattached-Iowa’s Tom Schab (8:22.93), Badger Aquatic Club’s Ben McDade (8:25.69), Unattached-Minnesota’s Matt Hedman, Dubuque Hurricane’s Benjamin Colin (8:27.58), and Riptide Swim Team’s Timothy (8:31.91).